Selfridges, one of the world’s best-known department stores, used BrightSign’s solid-state players to help launch Denim Studio, the world’s largest denim store at its flagship location on London’s Oxford Street. The new Denim Studio at Selfridges London is the ultimate destination for denim lovers, encompassing approximately 26,000 square feet staffed by 50 denim experts selling total of 60 brands. Customers can choose from thousands of styles and hundreds of exclusives priced from £11 to £11,000, including specialties such as Paige’s diamond-encrusted skinnies and J Brands’ Little Black Jeans. Selfridges hosted an event – Denim Exclusives – to mark the launch of Denim Studio. 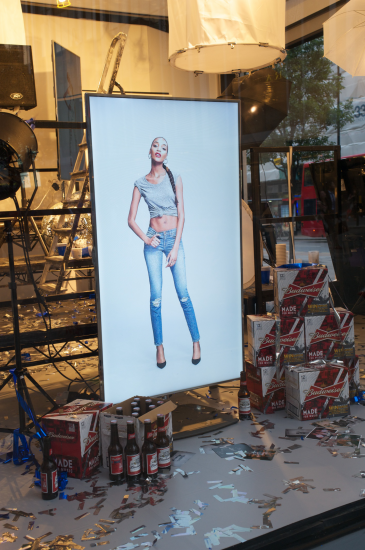 BrightSign’s solid-state players used in the Denim Exclusives event powered screens in four of the most notable windows in Oxford Street’s best-known department store. Its most prominent window – on the corner of Oxford Street and Orchard Street – was converted into a photographic studio featuring eight screens driven by BrightSign players. Two additional windows incorporated a mixture of portrait and landscape screens delivering a live Instagram feed showing customers wearing their own favorite denims. A final window displayed a looped time-lapse video. Displays in each of the windows also featured a ticker tape based on an RSS feed of Selfridges’ own content. The windows promoting Selfridges’ Denim Studio will be on display throughout the months of July and August 2013, two of the prime shopping months of the year. Selfridges rotates its display windows frequently to reflect seasonality and store promotions. Digital signage typically plays a prominent role in these windows, and BrightSign’s players are integral to enabling these unique deployments.